Thirty five years ago I was in India, driving in a campervan on a dusty road, which had been confidently marked on the map as a motorway. It was called National Highway 7 and ran for 1300 miles to Calcutta. The campervan literally bounced its way for five days on the worst road surface I’ve ever experienced. By the end of the journey, my back was wrecked and my head sore from hitting the ceiling every time we encountered a bump. The car survived – I have a picture of it, covered in dust, beside a smart government road sign that reads: Roads Reflect The Culture Of A Nation. That was in 1979, so I imagine the Indian Government will have improved National Highway 7 since then. It’s almost certainly the smooth 6-lane highway the map promised. Unfortunately we’ve had no such luck in Northumberland. If roads reflect our culture, then, frankly, Northumberland is a backward philistine. I reckon our county must have the worst-maintained roads in Britain – as bad as any third world country. We, and our council, should be ashamed. On the face of it, Northumberland says it cares about tourism. But imagine what our visitors must think of us as they navigate our potholes. In three weeks’ time, my son’s new in-laws have accepted our invitation to pay us a visit. They are German, from a land where every road, down to the smallest lane in the tiniest village, is super smooth. They really care about their cars, the Germans. So I’ve been trying to imagine what they will think of us as I drive them from the station to our house. They won’t be able to miss the bumps. Try as I might, I can’t think of a route to our house that doesn’t involve me driving in the middle of the road to avoid the strings of holes and cracks. Now if you think I have a bee in my bonnet, you’re right. I’m in a very bad mood. I’ve just received a £450 estimate from my Volvo dealer for a new wheel. Last week, having just got round to replacing my winter tyres with their summer cousins, the bloke at Volvo who swapped them over told me that one of my smart alloys is damaged beyond repair. He invited me under the ramp to see for myself. Sure enough, on the inside it was bent like tin of cheap beans. What could possibly have caused such damage? Certainly not a kerb – it was on the wrong side. 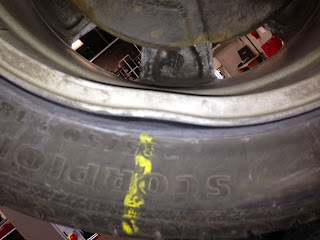 The engineer was absolutely certain: I’d hit a pothole, and a big one at that. The road from Newcastle to our house is riddled with them, and has been for as long as I can remember. This isn’t a remote country lane, by the way, it’s the main tourist drag between Ponteland and Rothbury – hundreds of cars use it every day. Navigating between the potholes is an art. You have to swerve to the middle to dodge one, and get back to the side again before you hit an oncoming car. As the holes occur every 20 feet or so, for miles on end, this makes for quite a journey. There was one particularly nasty crevasse which appeared a few months back. About 2 feet across, it must have been 6 inches deep. When filled with water it became invisible. When my big Volvo hit it at 40 mph, it was as bone-shattering as any Indian highway. Finally, this week, the council sent round a team to do some patching. They are there this morning, painstakingly filling up each hole with gunk and putting some chippings on the top, which will then have a fine time smashing windscreens for the next month until the gunk comes out and they have to come round and do it all again. It’s a shambolic make-and-do kind of job. What we need is a new surface. Meanwhile, do you think the council will pay for the cost of my new wheel? We’ll see.